Chicago Gateway Green announces its Fourth Annual Texas Hold ‘Em charity tournament beginning at 5:30 p.m. Wednesday, July 15 at Galleria Marchetti (825 W. Erie St., Chicago). Texas Hold ‘Em players buy-in with a $150 donation, which earns them $5,000 in chips and the chance to win the grand prize donated by Horseshoe Casino, just 20 minutes from downtown Chicago: a spot in the 2010 World Series of Poker Tournament in Las Vegas, Nev. In addition to Texas Hold ‘Em, a variety of other gaming has been added to this year’s event including roulette, craps and black jack. There also will be ‘Sit and Go’ tables where eliminated players have the opportunity to buy back in to poker games, although they will no longer be eligible for the grand prize. For those not trying their luck at the tables, spectator admission is $25. Guests are encouraged to ‘get in the game,’ and take a chance for a great cause. Due to the charitable nature of this event, no cash is awarded; however, all players are eligible for a variety of prizes for each of the games. All proceeds benefit Chicago Gateway Green, a nonprofit organization dedicated to the greening and beautification of Chicago. In 2008, more than 120 players participated, including local media personality Richard Roeper, columnist for the Chicago Sun-Times as well as other celebrities, including television personalities Mookie Lee from Survivor: Fiji, and Ali Azhar of HGTV fame. This year’s event promises even more celebrity participation including WBBM-FM B96 afternoon personalities, Stylz and Roman, who serve as celebrity emcees for the event providing special announcements and commentary throughout the evening. Last year’s event raised more than $30,000 for Chicago Gateway Green to continue their mission of the greening and beautification of Chicago’s expressways, gateways and neighborhoods. “We are very happy to be working with Chicago Gateway Green and Horseshoe Casino on this charity tournament again this year, and hope to raise even more money for a wonderful cause that improves the quality of life in Chicago,” says event producer Michelle Durpetti, managing partner of McGowan Durpetti & Associates, a Chicago-based event production firm specializing in event management, creative development and production. Guests at the event also are treated to a lavish appetizer buffet as well as an open bar with soft drinks, beer, wine and premium spirits with the admission fee. An outdoor patio lounge invites guests to take a break from the game and enjoy the lush Marchetti garden setting and other amenities including a professional cigar roller. Chicago Gateway Green is happy to have a number of charitable donors and partners for this year’s event including Horseshoe Casino, Chicago Magazine, WBBM-AM, 96.3 WBBM-FM, Votre Vu, Diva Limousine, SYN Vodka, 316 Barber Spa, Joseph A. Bank and Kurman Communications, Inc. Special thanks to North Bank whose volunteers are acting as the evening’s charitable gaming cashiers. The all new 500 million-dollar Horseshoe Casino, a Harrah's Entertainment, Inc. property, just 20 minutes from downtown Chicago is the premier entertainment and gaming destination in Chicagoland. Where legendary gaming lives on, Horseshoe boasts more than 350,000 square feet with 3,200 slot machines, nearly 100 table games, the largest poker room in the Midwest, keno and more. 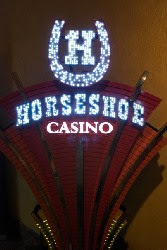 The Venue at Horseshoe Casino is proud to offer the ultimate concert and entertainment destination. In conjunction with AEG Live and created by the award-winning designers of Sceno Plus, The Venue offers a premier experience in a flexible space that can hold up to 4,000 guests. Dining elegance is not overlooked and guests can choose from a variety of dining options including; Jack Binion's Steak House which overlooks Lake Michigan, around-the-globe variety at the Village Square Buffet, a taste of Chicago at Benny's Home Cookin’, and scrumptious fare at J.B.s Gourmet Sandwiches and Salads. For more information, call 866-711-SHOE or visit www.chicagohorseshoe.com. The charitable gaming license number for this event is CG-01597. Proceeds from the Texas Hold ‘Em event will benefit Chicago Gateway Green, a non-profit organization that has been dedicated to the greening and beautification of expressways, gateways and neighborhoods of Chicago for more than 20 years. For more information about the organization, call (312) 540-9930 or visit www.gatewaygreen.org.